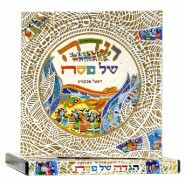 At the Passover seder, some fifty years ago, my eight-year-old son and I were studying a well-illustrated Haggadah. “Who is that?” he asked, pointing to a picture. He nodded and pointed again. Another nod and another question. “Hittle er … what holiday?” he asked naively. I must have hugged him, perhaps mumbling some words. I really don’t remember. I didn’t have any answer then. Last year, while walking home from shul, after saying the Kinos of Tisha B’Av night, an answer came to me. “What holiday?” What holiday, indeed. Finally … I knew the answer to my little boy’s question. The answer to the question about “What holiday celebrates the victory over Hitler?